This image at the head of the page, again one of the [NMR] photographs, is a view taken form the rear of the main elevation, directly behind the pictures on the previous two pages. The image highlights a few aspects which have assisted in making decisions abvout how the building was demolished. In the foreground and to the right are some small trees or shrubs and generally all the foreground is covered in grass, suggesting that the demolition was undertaken in various stages and not as is generally believed, done in 1952 when this picture was taken. To the right is the stable block and near the chimney is the Cupolla which was above the entrance to stables. [See notes] Sadly the stables were demolished in the 1960's. 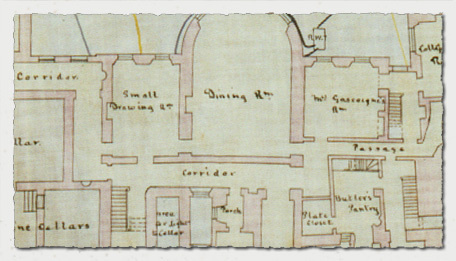 The image above shows the corner of the small drawing room, the recently discovered cellar lies beneath this room. The demolition of the hall to the north of this section had left the external ground level a few feet above the ground floor of the hall, hiding the entrance stairs down to the cellar. The stairs at the foot of the image above lead from the ground floor to the first floor, the cellar steps are beneath this flight. 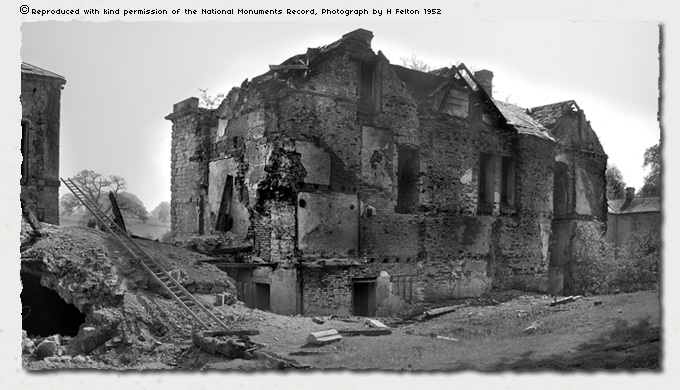 The photograph of the demolitions by H Felton, was recently brought into new focus when clearing the ground at the head of the cellar excavations, a large piece of masonry was found just beneath the surface. It instantly reminded me of the piece of stone in the foreground of the picture and whilst it cannot be proved to be the same piece of masonry, the position is almost identical to that in which it was lying in 1952, simply covered by about a foot of topsoil and demolition debris. An enlarged view of the lead covered domed roof Cupolla above the entrance to the stables. The roof in the foreground is the Brewery , yes, they lacked for nothing! 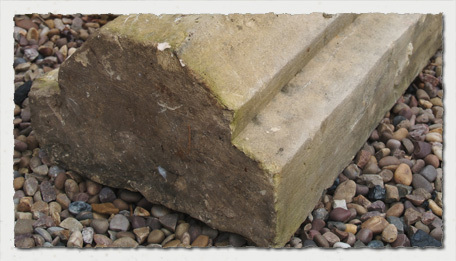 A piece of masonry believed to be the one on the 1952 picture to the left. 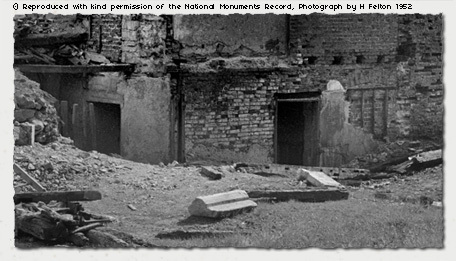 The National Monuments Record, based in Swindon, Wiltshire is the public archive of English Heritage and have a collection of over 10 million historic photographs. The pictures of Parlington were taken during 1952 by Herbert Felton F.R.P.S. They were presented to the [NMR] in November 1953.